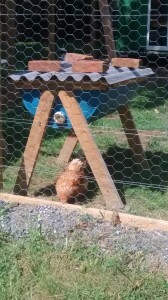 We have our beehives in our chicken run, and some people have asked how the bees and chickens get along. Beekeepers said the hens would eat the bees, and others worried if the bees would harass the hens. We have found that the bees and the hens don’t interact at all. Then hens go all around under the beehives pecking at the ground, and the bees ignore them. We have four different chicken breeds, and we have hens and one rooster, but across the board all the chickens ignore the bees. Some hive pests, such as hive beetles, lay eggs in the ground around beehives. The hens should eat some of these pests when they’re foraging under the hives. We cannot say that happens for sure, but I can say that we have had hive beetle problems in the past, and since we have placed the hives in the chicken run we have not had any pest problems.